Special Effects		Harry Redmond, Jr.
An RKO-Radio Pictures production, based on an idea conceived by Cooper and Edgar Wallace. Originally envisioned as a vehicle for a live gorilla to fight a Komodo lizard. Wallace died in February 1932, without writing a word of the script, but he had been promised screen credit; also, as a best-selling novelist, his name had considerable drawing power. He was replaced by Creelman, but it was actually Rose, Schoedsack's wife, who wrote the dialogue. Two and one-half years in production, it was filmed mainly on soundstages, generally under Schoedsack's direction. Cooper worked mainly with O'Brien and directed some live action sequences with the life size KONG props. The original working title was THE BEAST, and the property was also known as THE EIGHTH WONDER and merely KONG (meaning "gorilla".) The latter was vetoed by the studio as sounding too much like the early documentaries (CHANG and RANGO) of Cooper and Schoedsack. The production cost only $672,000 (actually $430,000 plus overhead from CREATION, a prehistoric wild life picture Obie had been working on, envisioned as a cross between THE ADMIRABLE CRICHTON and THE LOST WORLD). This cost was assigned to KONG because it profited from development of Obie's stop motion animation process and used some of the dinosaur miniatures designed by O'Brien and built by Marcel Delgado. The sum is so low (by today's standards; an "A" picture in 1933 was budgeted around $200,000) also because use was made of the set built for THE MOST DANGEROUS GAME (1932): an elaborate affair which included a swamp, cliffs, waterfall and a ravine bridged by a fallen tree; with glass art by Mario Larrinaga and Byron L. Crabbe and special effects by Harry Redmond, Jr. The great wall was from DeMille's KING OF KINGS (1925) and the native village from Vidor's BIRD OF PARADISE. Kong and the dinosaurs were animated by stop motion photography, a painstaking process where only 1/16th of a foot of film was exposed at a time. These scenes, based on detailed preproduction sketches by Larrinaga and Crabbe, were then added to live action sequences by means of back projection and traveling mattes. The sets for the animation were built on table tops, with numerous holes drilled to clamp the metal feet of the miniatures. The illusion of depth was created by glass paintings (created by Larrinaga and Crabbe) as many as three levels deep, with miniature sets between the panes. This is now a lost art, having been replaced with newer, more sophisticated matte and optical processes which themselves have been obsoleted by computer generated imagery (CGI) in which no physical models of the creatures and sometimes even the sets exist at all. There were six Kongs 18 inches high, made of high-tempered dural, covered with pruned rabbit fur, which gave the model that characteristically ripply effect, as it was positioned for each frame. There were no men-in-apesuits or giant stand-ins, but there were a life-sized hand; foot and lower leg; and head, chest and shoulders. The latter had the following dimensions: eyes, 12 inches in diameter; teeth, 10 inches long; mouth, 6 feet wide; ears, 1 foot long; and nose 2 feet across. 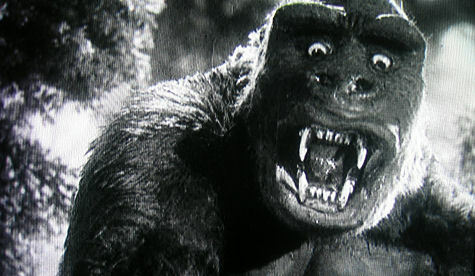 Although pains were taken to keep the miniatures in constant perspective, dramatic license was invoked so that Kong appeared about 18 feet in the jungle scenes and 24 feet among the skyscrapers of New York. The animators studied slow motion films of elephants to develop the dinosaur movements. Although O'Brien is often given total credit for the miniatures, he was assisted in the animation by a large staff, and the models themselves were actually sculpted by Marcel Delgado, who had worked with Obie since THE LOST WORLD, a 1925 silent. This was Cabot's first starring role; he had previous acted under his real name, Jacques de Bujac; however, due to KONG's long shooting schedule (more than ten months) he actually made his official debut in ROADHOUSE MURDER. Wray also worked simultaneously in DR. X, MYSTERY OF THE WAX MUSEUM and THE MOST DANGEROUS GAME while animation caught up with the live action. Schoedsack and Rose previously worked on RANGO (1931); while Cooper and Schoedsack produced and/or directed GRASS (1925), CHANG (1927), THE FOUR FEATHERS (1929) and THE MOST DANGEROUS GAME. The latter was written by Creelman, with music by Steiner. In addition to Wray, it starred Armstrong, Johnson, Flavin and Clemento. Upon editing, KONG was found to be 13 reels, which was considered unlucky. Therefore, the elevated train sequence was added, but the resulting 14 reels were judged too long, so the film was re-edited down to 11 reels. All sound effects -- including Wray's screams -- were added after filming was completed. They were recorded under primitive conditions of only three tracks: one for music, one for dialogue and one for effects. Kong's roar was a mixture of lions and tigers, reversed and slowed down. After the score was completed, the sound effects were altered in pitch to conform to the music, an at-the-time unprecedented event. RKO had told Steiner not to write original music but to edit existing tracks; however, Cooper offered to pay for a new score out of his own pocket, an ultimate cost of $50,000. Portions of this score have shown up in numerous later films. The movie opened in New York in March 1933 simultaneously at the Roxy and Radio City Music Hall, seating a combined total of 10,000 people and setting a world record for indoor attractions. It made $89,931 the first day, even at Depression prices. The official premiere was later the same month at Grauman's Chinese Theatre in Hollywood, where audiences had the opportunity to ogle first-hand the life size head of Kong in the forecourt. Many sources list the Wray character as Ann Redman. The film grossed $745,000 in the US and Canada and $1.1 million elsewhere during its initial release. It took in $300,000 on its 1938 reissue, despite the fact censors had implemented several cuts. It made $320,000 in 1942. In 1952 it earned 2.5 times the expected gross of a new "A" release, and prompted TIME magazine to name it "Movie of the Year" even though it played on a double bill with a Val Lewton horror film. It was again paired with a Lewton thriller on its 1956 reissue (where I was lucky enough to see it at the impressionable age of 9 in a real movie theatre, the way it was meant to be seen). It was released to television in 1955 and has been a perennial ever since. Although RKO General stills owns it, Janus acquired theatrical distribution rights in 1966, when it was renting for only $10 a week. In 1971 they restored most of the excised segments, totaling six minutes, but the original main and end titles are still missing, as are scenes of sailors being bitten to death by the brontosaurus. The reinstated segments include scenes of Kong removing Wray's clothing; Kong biting the head off one Skull Island native and crushing another underfoot; and Kong dropping the "wrong" girl into the New York street below, while he is searching for Wray. Novelized by Delos Lovelace in 1932, the rights were subject for litigation among Universal Pictures, RKO General and Dino DeLaurentiis in 1976. Paramount financed DeLaurentiis' 1976 remake, which was followed by one sequel. A sequel to the original was quickly done in 1933, entitled THE SON OF KONG, with many of the same behind- the-scenes talent: Cooper, Schoedsack, Rose, Steiner, Polglase, Spivack, Cheesman, O'Brien, Delgado, Larrinaga and Crabbe; the following cast members recreated their roles: Armstrong, Reicher, Wong, Johnson and Clemento. Three Kong Jrs. were constructed from the armatures of the original Kongs.